Fund the People created this discussion guide to help your nonprofit team initiate a meaningful conversation about your people-systems – the organizational practices, policies, habits, and structures that support and strengthen the morale, ability, and advancement of employees and volunteers so that they perform at the highest levels of excellence at present and in the future. 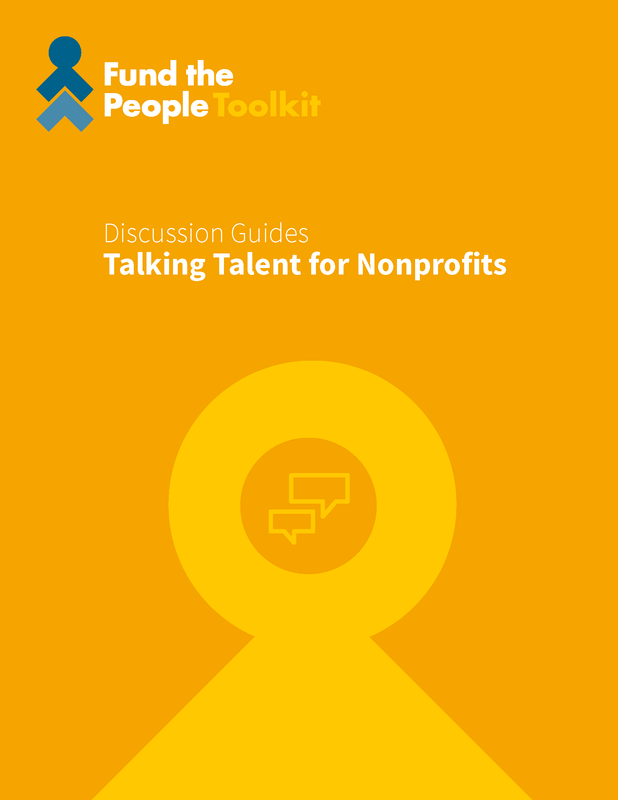 This guide will help your nonprofit to identify your strengths and challenges, so that you can subsequently plan, budget, and secure resources to build on the strengths and address identified talent challenges. Use this guide with your entire team or sub-groups (i.e., emerging leaders, line staff, managers, board members, etc.). We suggest sending the questions to your team in advance so they can reflect, inquire for data, and take note of their own thoughts. If you believe sensitive issues will arise, you might want to create an anonymous survey based on these questions, then hold a facilitated team meeting to discuss the results. Facilitation: More important than the questions, securing skilled facilitation is crucial to having a frank and productive conversation. Consider professional facilitation, if possible. You may also engage the best facilitator on your team or find a skilled volunteer who is allied with your organization. Buy-In: Before your organization can secure resources to invest in talent, this conversation should take place across the organizational chart, from bottom to top. Executive leadership should discuss with the board; emerging leaders and apprentices (such as interns) should weigh in as well. Optimally, the board and staff should be aligned in their thinking about how intentional staff development can advance the organization’s performance, impact and sustainability. Think/Pair/Share: Ask each member of your staff or board to consider the questions posed in the discussion guide, taking notes as they silently reflect. Individuals should then discuss their responses with one or two other people before sharing highlights with the full group. Use selected questions as a reflective exercise at the start of your next meeting or series of meetings. Create a team of staff and board representatives to explore talent funding. Ask them to determine responses to these questions after conversations with other staff and board members. What do we believe are the benefits of investing in our organization’s leaders and staff? a. Are perspectives aligned across our organization and between board and staff? Describe the perspectives. b. To what extent do our practices align with our beliefs about investing in talent? How is talent currently developed in our organization? a. Think about formal and informal learning opportunities, internal and external trainings and programs, and development available to new and seasoned staff. b. Is there a focus on opportunities, equity and inclusion across your organization’s talent development systems? If not, how can you begin to incorporate this into your strategies, tactics and activities? Are current talent development practices sufficient to attract, retain, and develop the staff our organization needs to accomplish our mission? Why or why not? b. Approximately what percentage of time (by the executive team, managers, and/or the board of directors) goes toward developing our people? What gets in the way? c. How are we incorporating an equity and inclusion lens into attracting, retaining and developing our staff? Do our organization’s funders understand our talent development needs? a. Do we ask them to invest in our people? Why or why not? What could we accomplish with more funding for talent development? b. What impact could an increase in talent investment have on specific programs/activities that our funders support, our specific issue areas, ultimate beneficiaries and/or our mission? c. How could having an explicit focus on equity and inclusion impact our target audience and mission? d. What is the strongest case we could make to our funders for talent funding? What else do we need to learn about our assets and talent needs in order to move forward? How can we frame our needs so that the benefits of investing in talent development are clear and compelling? Which of our funders might we approach about investing in our talent development? What do we already know about their priorities and openness to a conversation about this topic? How do we see equity and inclusion as integral to developing our talent? Who else needs to be involved in this conversation in order for it to succeed? Financial support for Fund the People’s Toolkit has been generously provided by American Express, Annie E. Casey Foundation, David and Lucile Packard Foundation, Durfee Foundation, Ford Foundation, Kresge Foundation, Robert Sterling Clark Foundation, and W.K. Kellogg Foundation.